The high standards of care which every child enjoys and the excellent quality of preparation as they begin their journey through life. The strong leadership provided by Louise Payne and Juliette Reynolds, supported by the management committee and the Davison High School family. The dedicated staff team who are committed to making each child feel happy and valued. Our close association with the school allows us to access a wealth of experience, advice and support. The girls in the school and their parents have been remarkably generous in supporting the nursery in terms of providing equipment and toys for the children. 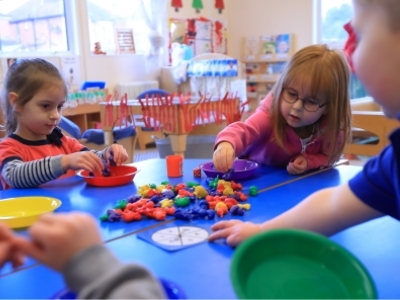 Here at Davison Day Nursery we believe in inspiring the children’s curiosity and enthusiasm for learning in a happy, active, and secure environment. We are guided by the EYFS framework where we support all children’s development, care and learning needs. Here are a few of the activities that reflect the broad range of opportunities that benefit the children’s progress ahead of them. 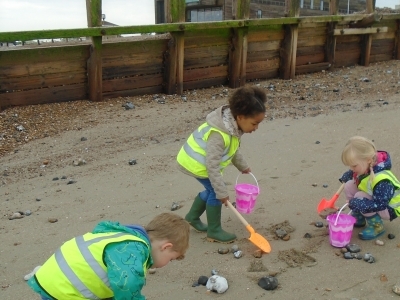 Beach School has the same ethos as Forest School. It encourages children to learn through play and to explore an outdoor environment. Ultimately Beach School provides an enabling environment for children to learn, explore and have fun through both planned and natural exploration. The children are offered a free-flow environment, which enables them to choose to play independently in our large outdoor space. 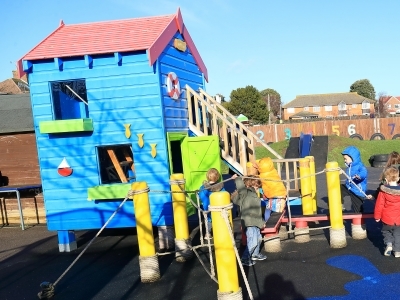 Here they can use the large range of equipment, access areas such as the mud kitchen, roll down our hill, play on the slide or tyres, mark-make on the whiteboards and painting wall, or develop their understanding of the world by using our purpose built area for growing plants and vegetables. We encourage the children to find ways to represent and develop their own ideas in all areas of creativity. 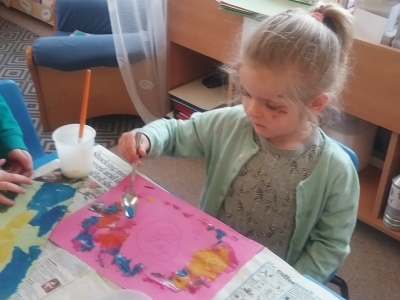 They are able to access our ever expanding craft resources to create their individual designs and share their thoughts in a variety of activities in art, music and movement, dance, role-play and technology. 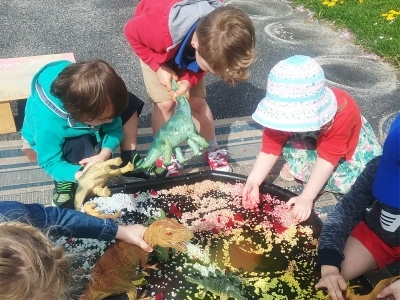 We offer opportunities for the children to make sense of the world around them, by exploration and investigation in a safe, challenging environment. Alongside our daily routines, we are extremely fortunate to have access to the sports facilities at Davison High School where the children are able to participate in a variety of fun activities. Here children can develop their large motor skills, such as coordination, control and movement. We also have a visiting teacher who provides the children with a programme of opportunities to be both active and interactive (such as Dough Disco). We are aware of how important it is for children to have an understanding for problem solving, using numbers and distinguishing between sounds and letters of the alphabet. We therefore offer numerous fun activities (both indoors and outdoors) to encourage the development of these foundational skills through play. Davison Day Nursery is committed to providing high quality care and education for children aged 3 months to 5 years in a homely and caring atmosphere. Children are able to learn through play and we are reflective practitioners of current curriculum guidance and legislations. Provide a safe, secure and healthy environment, which is warm, caring, happy and responsive. Ensure that all children have access to a wide range of fun activities and opportunities. Encourage positive, self-confidence and ability to benefit from all opportunities presented. Work with parents as partners, in order to meet all their child's needs. Help the child to feel and prepared for the beginning of their school adventure. We at Davison Day Nursery, make sure that the needs of the children always come first. Provide learning activities which will enable to progress in all areas of development at a pace and level which reflects their abilities, needs and interests. All staff are enthusiastic, friendly and thoroughly committed to creating an ideal environment for anyone’s baby/toddler to be left, to be cared for whilst parents work. Everything about DDN is wonderful. 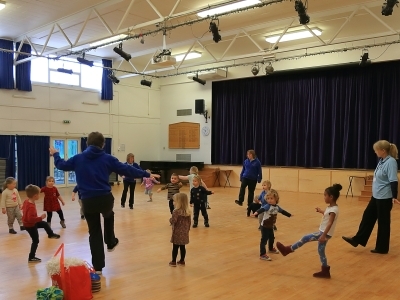 The staff are friendly, helpful, experienced and have excellent relationships with each child. Davison Nursery is wonderful. It provides our son with everything a child could possibly need in helping them develop into little adults. Nothing is too much trouble for the staff. The nursery is led by example. The leadership is strong. Parent partnership and the child’s voice are prioritised. The staff are professional, yet you feel part of a family at the same time.